Introduction: The surgical standard of care for favorably located, small renal tumors is partial nephrectomy. As the incidence of renal cell carcinoma (RCC) and earlier incidental detection of small kidney masses has steadily risen over the past twenty years, minimally-invasive management of these lesions has become more common. 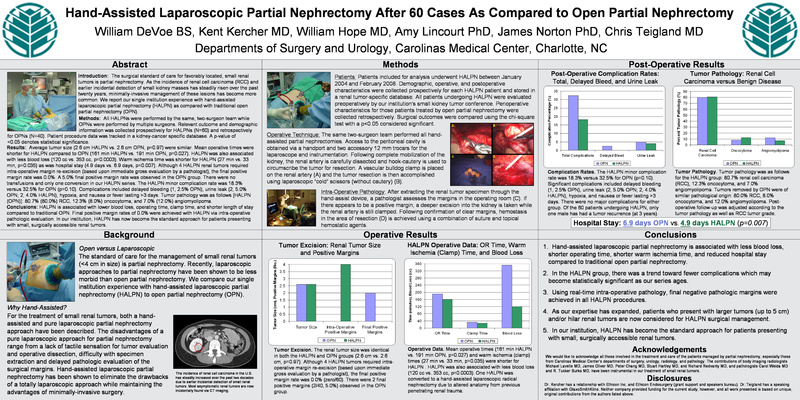 We report our single institution experience with hand-assisted laparoscopic partial nephrectomy (HALPN) as compared with traditional open partial nephrectomy (OPN). Methods: All HALPNs were performed by the same, two-surgeon team while OPNs were performed by multiple surgeons. Relevant outcome and demographic information was collected prospectively for HALPNs (N=50) and retrospectively for OPNs (N=40). Patient procedure data was tracked in a kidney-cancer specific database. A p-value of 3 days. Tumor pathology was as follows [HALPN (OPN)]: 80.9% (80.0%) RCC, 12.8% (8.0%) oncocytoma, and 6.4% (12.0%) angiomyolipoma. Conclusions: HALPN is associated with improved operative times, blood loss, hospital stay, clamp time, and complications compared to traditional OPN. Final positive margin rates of 0.0% were achieved with HALPN via intra-operative pathologic evaluation. In our institution, HALPN has now become the standard approach for patients presenting with small, surgically accessible renal tumors.